Since the financial crisis of 2008 the bookshops are flooded with works of authors, who each for himself believes to be able to explain the economic collapse. Generally, they assume that the crisis occurred unexpectedly, like a bolt from the blue. In fact this assumption is wrong. Already in 2006, Joachim Bischoff wrote a book, titled Zukunft des Finanzmarkt-Kapitalismus (VSA-Verlag), in which he describes in a clear way the instability of the modern financial system. Despite the experiences since the publication of his book, to my knowledge no other book has appeared in recent times, which can compete with its solid and thorough analysis. Joachim Bischoff is a German author, whose field of interest is the political economy. He writes books, and is an editor of the Zeitschrift Sozialismus. He positions himself politically on the left side of the social-democracy, and is active mainly in pluriform left networks like Attac. Fortunately, his work lacks the pedantic tone and crooked arguments, which are so common for many other radical authors. On the contrary, he underpins his arguments by means of instructive graphs and tables. In Zukunft des Finanzmarkt-Kapitalismus Bischoff states that since 2000 the financial industry has expanded so enormously, that she has become leading in the global economy. Especially the amount of property-titles has increased. There was a change-over to using the future produced wealth as securities for credits. In fact there is no generaly accepted reason for this volte face. Since the seventies of the last century the accumulation on the financial markets has accelerated1, because the gains on capital improved. Of coarse this occurred at the cost of the labour share in the total income. The deregulation (liberalisation) of the capital transfers in the eighties has stimulated this development, and has caused a power shift in favour of the capital owners. The expansion of the financial industry, in addition to the traditional core activities, namely the supply of credits, has led to new financial products. Investment funds become a second source of capital for enterprises, besides the banks. Also the rise of pension funds fits in this development. The shareholders get organized, and demand influence on the management of the enterprise. This is called shareholder value organization. While during the main part of the twentieth century the enterprises have strived for growth, now the profit from capital obtains the highest priority. The high requirements for interest imply, that many possibilities for investment drop out in advance. Investors have a short time horizon. In this way the research and development of products is discouraged. Bischoff states, that the new financial regime has not always produced more prosperity2. The trade in securities speculates on a future share in wealth from production in the future. The newly produced capital becomes a competitor of the existing capital3. The hunt for higher interest rates comes down to a revaluation of property-titles (shares, real estate, etcetera). Moreover it also happens, that property titles rise significantly in value, just because of illusory expectations. Bischoff believes that this new regime of market activity is risky. The revaluation of property and securities is the core of the neoliberal growth strategy. According as the value of property rises, that property can be the pledge for even larger credits. The economic growth does not require a growing real product, but only the expectation of growth. This is called asset-based keynesianism. In the USA this model has turned out to be successful between 1995 and 2000. On the other hand it has failed in Japan, so that this country experiences a recession since 1990, coupled with an enormous national debt. In 2000 the American New Economy bubble ended. The administrations of Clinton and Bush tried to fight the looming recession by means of cheap money, tax reductions, and an expanding armament. Indeed the real estate bubble stimulated the consumption. However the balance of payments and the budget surplus changed into deficits. Bischoff warns (in 2006!) that the debts wil become unsustainable. A situation can occur, where the economy will no longer know the values of property titles. That is fatal for the durability of economic activity. The neoliberal regime increases the social risks and therefore has disavantages for the common workers. The increased competition forces them to become more flexible, which sometimes ends in precarious wage levels. The big industries put out to contract their less profitable activities to the small entrepreneurs. They buy innovations from successful small pioneering companies. There is a conceivable risk, that the winners will appropriate all of the growth in the surplus value. In many western states the mass unemployment has become a normal situation. Because of the tax reductions the governments suffer from an increasing national debt. In this way the poorest states are forced to abandon a part of their public services. The state transforms from a supplier of services to a supervisor of contracts. The political power shifts to the upper middleclass. Bischoff criticizes the risks of the neoliberal regime, and calls it foreign to nature. He advocates more social management and a mixed economy4. Public investments could reduce the unemployment. A high wage level is favourable for the consumptive demand. The continental and global regulation require the reinforcement of the international institutions. 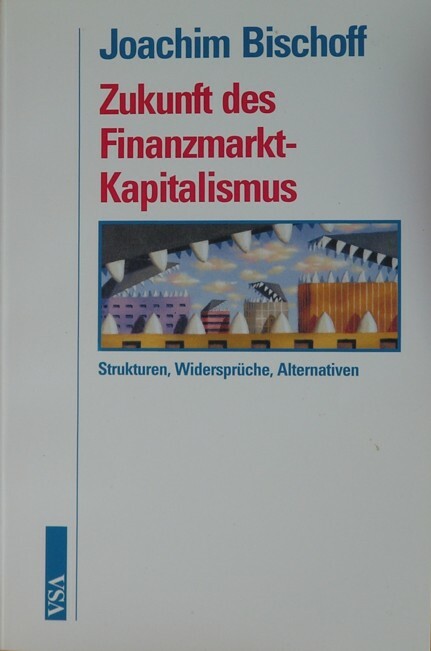 The book Zukunft des Finanzmarkt-Kapitalismus is a very complete study. It reveals the causes of the crisis, and makes recommendations for improvements. The most fascinating part is the description of the asset-based wealth-driven economy, which is nothing more than a pyramid game, and in the end is bound to fail. There is no guarantee for a soft landing, which in 2008 did stay away. The managers in the financial sector have consciously taken this risk, in order to take advantage of the situation as long as possible. Of course the recommendations of Bischoff are not the definite answer. For instance it could well be, that some new financial products do contribute to a more efficient turnover of transactions. But undeniably the neoliberal regime has passed its date of tenability, and the new policy should at least take the direction that Bischoff has pointed out.